When Google App Engine (GAE) launched in preview for 20,000 developers in early 2008, few would have guessed that it would reach 100,000+ active developers per month and 200,000+ active apps per month in just a few years. Cloud computing was still on the rise in Gartner’s Hype Cycle and hadn’t quite reached the Peak of Inflated Expectations stage. App Engine offered a fully-managed platform that allowed you to run your application on top of Google’s infrastructure, handling the “deep-in-the-weeds” infrastructure work for you so you could instead focus on developing your application quickly. In exchange, you were limited, at least in the beginning, to developing your app using pre-defined and configured services. But once you accepted this minor trade-off, you benefited with a faster time to market for your critical application and required less time and money to deploy your app in the cloud. Additionally, GAE was the first serverless development model which meant that Google handled the thorny infrastructure operations and servers effortlessly and automatically scaled up and down as the workload required. It is a simply brilliant and efficient development model. Since then, App Engine has quietly become the platform of choice for thousands of companies, from startups to large enterprises; including companies like Snapchat, Ubisoft, Motorola, Coca-Cola and Best Buy, who recognized the benefits and developed their applications on GAE. Some industries may require that your application run in a cloud environment that meets certain regulatory or statutory requirements. HIPAA for health data and FedRAMP for federal government engagements are two or many examples. Additionally, data sovereignty laws may be involved depending on where your data resides in the cloud. All clouds are not created equal. Although Google has datacenters around the globe, some regions, such as mainland China, may not be accessible. These geographic limitations restrict deployment options, impact revenue growth and introduces operational risk. App Engine has a different billing model than your traditional occupancy based IaaS model, which has benefits but also some challenges depending on your application. The App Engine pricing model charges you by the API call, which makes it very affordable when you’re just starting to develop your application. App Engine also provides a free quota, so if you don’t have many users in the beginning, you don’t pay anything. However, when your application starts to gain traction and scale, your Google bill can become very expensive very quickly. When usage increases over a certain point, an IaaS billing model with a fixed price per virtual machine might be the better option. AppScale is an easy-to-manage serverless platform that enables you to quickly and easily build, deploy, and run your application, just like App Engine. How do we do this? Simply put, we’re the open source version of App Engine, where we faithfully implement App Engine’s APIs but allow you to deploy your application to any infrastructure. With AppScale, you can avoid all of the challenges mentioned above by running your app on-premises, in a Chinese cloud like Alibaba or Tencent, or on Azure, AWS, or even Google Compute Engine (GCE). Besides providing you application portability with our multi cloud platform, you’ll also see significant cost savings on your Google bill, ranging from 35% to 70%, depending on your situation. When leveraging AppScale, you still benefit from developing your application using the App Engine model but can also deploy your application on a virtual machine (VM) on the infrastructure of your choice. Instead of paying per transaction, you now pay per VM. Even switching from GAE to AppScale on GCE can save you significant expense. To make it easy for you to compare the cost of running your GAE application in Google vs. deploying your app on AppScale in another public or private cloud, we’ve created the GAE Cost Calculator. For each cloud provider, we have chosen a commonly used number of VMs if you were to migrate your application using AppScale's serverless platform. 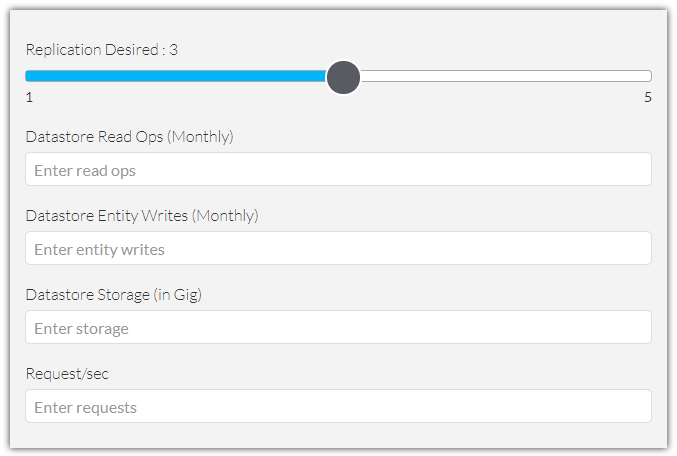 The calculator only require 5 variables to calculate the cost of running on AppScale on AWS, GCE, Azure, IBM Cloud, or Alibaba Cloud. Have your App Engine bill ready, and then visit the GAE Cost Calculator and try it out for free to see your savings. For detailed information on how to use the calculator, check out the step-by-step instructions. Still have questions? We're always here to help, just contact us and we'll get back to you asap.